There are many algorithms to generate maze. (http://en.wikipedia.org/wiki/Maze_generation_algorithm). After generating the maze we’ve to validate whether it’s a valid maze or not. 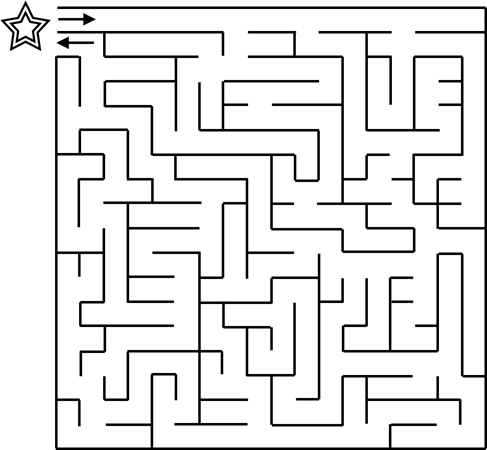 A valid maze has exactly one entry point and exactly one exit point (exactly 2 openings in the edges) and there must be atleast one path from the entry point to exit point. Given a maze, just find whether the maze is "valid" or "invalid". The first line consists of an integer t, the number of test cases. Then for each test case, the first line consists of two integers m and n, the number of rows and columns in the maze. Then contains the description of the matrix M of order mxn. M[i][j]=# represents a wall and M[i][j]='.' represents a space. For each test case find whether the maze is "valid" or "invalid". How do you see what TCs you pass? =(Francky)=> EB members and psetters can do that. Please alert, if you find some message to be deleted. getting WA on the 5th test case. plz, provide any tricky test case. I have gone through all corner cases but still unable to pass through.